The long-neglected PC got a massive injection of innovation last week with major announcements from Google, Apple and Microsoft. Each company introduced advancements that users didn't ask for, didn't think they wanted and are already complaining about. Why? Because we love new technology in theory but hate it in practice. Technology change is expensive, transition is messy and people are creatures of habit. We demand innovation, but resist it when it actually appears in our favorite product lines. That's why only tech giants like Google, Apple and Microsoft can force the necessary change users want, but don't know they want. This was a huge week for forced innovation in PCs thanks to wildly divergent new products from Google, Apple and Microsoft. Problem: Meeting technology isn't integrated into our cloud-first workflow. Solution: Google Jamboard, a cloud computer for collaborative meetings. Google's Jamboard brings meeting collaboration into the cloud. Jamboard is a "cloud-first whiteboard" optimized for Google stuff. 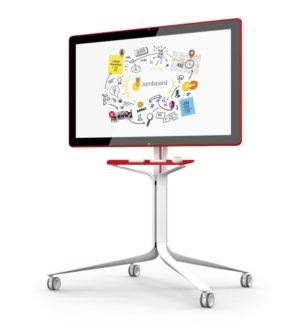 Jamboard is built around G Suite, the collection of cloud apps formerly called Google Apps for Work (Docs, Sheets and Slides), and Google Hangouts, the group video chat service. Jamboard also runs other cloud apps and services. 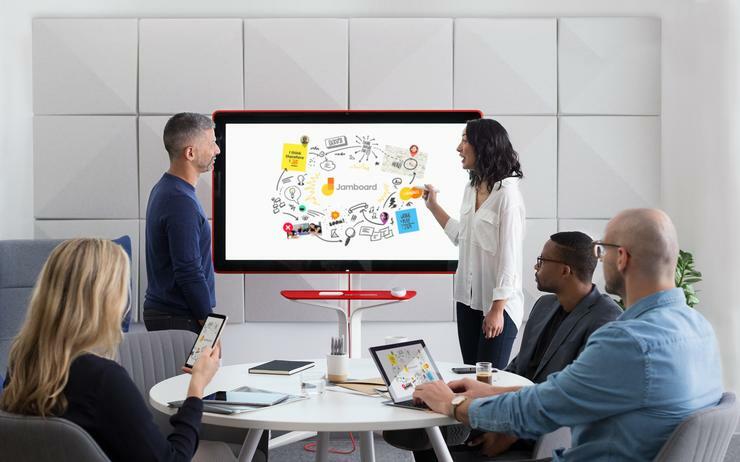 Jamboard can connect with other Jamboards for shared screens, collaboration and group videoconferencing, as well as with remote meeting participants using a companion app on a smartphone or tablet. That means whatever is happening in one meeting location is also happening on the screens of remote participants. All that collaboration and brainstorming is saved in a shared folder on Google Drive. Jamboard is a 55-in., 4K touch display that offers a built-in HD camera, some virtual markers and an eraser that doesn't require batteries. Jamboard starts at "under $6,000," according to Google. For now, Jamboard will become available to people selected for the Early Adopter Program. Companies don't want to make the painful transition from Windows PCs, PowerPoint and projectors to cloud whiteboards. But it's the right place for meetings to go, and Google is pushing it there. Problem: Laptops are a mishmash of obsolete technologies and interfaces. Apple this week unveiled a thinner, lighter MacBook Pro with a TouchID fingerprint reader, a bigger Force Touch trackpad and a customizable touch-screen strip above the keyboard called the Touch Bar. Apple is notorious for killing old standards. Users griped about the elimination of floppy drives and CD/DVD drives in MacBooks and the termination of the audio jack in the iPhone 7. The new MacBook Pro goes further, killing USB ports, SD Card readers and charging ports (and with it, the much beloved MagSafe connector!) in favor of four Thunderbolt 3 ports, which double as USB-C connectors, any one of which can function as a charging port, a data port or a place to connect an external display. 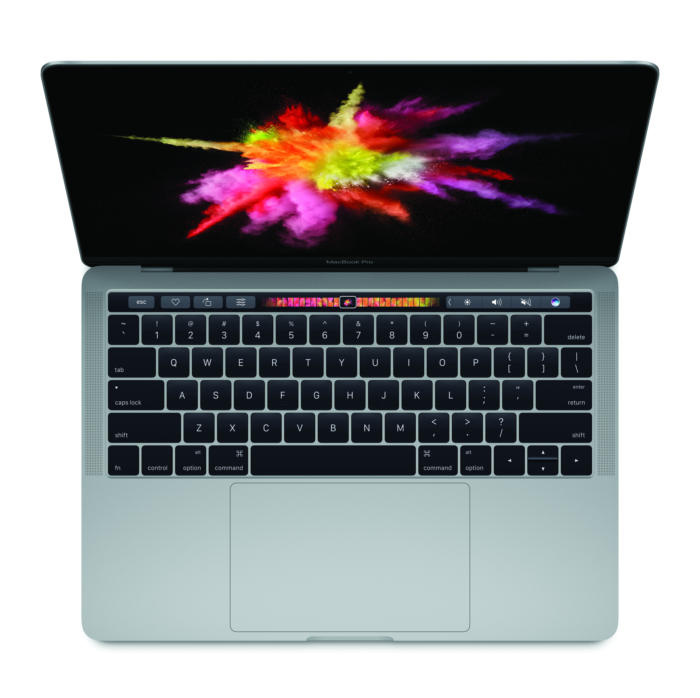 Apple's MacBook Pro kills the password, function key, Escape key, dedicated charging port, USB-A port and SD card. The replacement of old ports and readers is ushering in a dreaded "Donglepocalypse." Your peripherals won't work with the new laptop until you buy special cables and converter "dongles." Your existing devices that use HDMI, VGA or even Thunderbolt 2 ports will all need special adapters. Even an iPhone 7, which ships with cables that are Lightening on one end and USB on the other, need a replacement Lightning-to-USB-C cable that starts at $25 on the online Apple store. Apple's biggest fans, who will buy both iPhone 7 and MacBook Pro, will be swimming in dongles. "Donglepocalypse" is inconvenient and expensive, but the transition is necessary. Thunderbolt 3 enables devices to be daisychained out of the same port, and also the conveyance of massive quintiles of data, enough even for the LG 5K display designed to work with the new MacBook Pro. And USB-C is far superior in usage and convenience to the old USB-A standard. The MacBook Pro was tweaked, improved and optimized across the board, as Apple tends to do. The biggest change is the Touch Bar -- which is conceptually a context-aware, touch-screen version of the old function key concept. Buttons, controls and functionality changes with applications, and developers can program exactly what the Touch Bar looks like and how it works while their application is selected. In a single product, Apple killed the password, function key, Escape key, dedicated charging port, USB-A port and SD card. The MacBook Pro also introduced Mac users to two ideas that will transform future laptops. The first is the idea of touch screens on a Mac (the Touch Bar is just a thin strip, but it's technically a touch display). The second is the idea of solid state, on-screen keyboards. No, the Touch Bar doesn't give you QWERTY keys, but future MacBooks will. These are just two evolutionary steps to a solid-state MacBook of the future -- no moving parts except the clamshell hinge -- which will have touch-screen glass both top and bottom, a concept I first described here years ago. Pricing for MacBook Pros with the Touch Bar start at $1,799 for the 13-in. version and $2,399 for the 15-in. model. With the new MacBook Pro, Apple is dragging users kicking and screaming into a better laptop world. Problem: The PC has been stuck in the WIMP model (windows, icons, menus and pointing devices) since the Nixon administration. Microsoft unveiled this week a new PC called Surface Studio. The screen is large -- 28 inches measured diagonally -- offers a pixel density of 192ppi and is surrounded by minimal bezel. Microsoft claims that, at under half an inch thick, the Studio screen is the thinnest 28-in. LCD ever made. The touch screen is supported by two arms, and the computer is mostly inside the base. A four-point "zero gravity" hinge enables the screen to transition from vertical to nearly horizontal -- the 20 degrees is as low as it goes, which Microsoft claims is ideal for certain types of creative work, such as drawing, drafting and designing. It's called "zero gravity" because it takes almost no force to re-orient the screen. "Palm rejection" -- the ability of a touch screen to accept pen input without responding to the hand holding the pen resting on the screen -- is taken to extremes with Surface Studio. Microsoft says you can lean your forearms on the screen, and the screen will support the weight of your lazy upper torso. In the ancient WIMP model, peripheral devices rest on the same desk surface as the monitor. So while the documents, images or objects appear up there on the screen, they're manipulated down there on the keyboard and over there with the mouse. Next-generation PCs like Surface Studio bring everything to the screen. But to me, the breakout star of the week was Microsoft's Surface Dial, a silver hockey puck that turns like a knob, but also provides haptic feedback. You can use it as a peripheral device for a regular Windows 10 PC or laptop. But with the Surface Studio, you can place it directly on the screen and, depending on the app, the screen recognizes the device and surrounds it with interface options, such as color palettes. Studio customers will initially get seven apps that support the Dial, including a CAD app, a couple of PDF apps, a music composition app and a smattering of illustration apps. One of the drawing apps turns 2D drawings into 3D. Best of all, the Dial can be used even without custom integrations. Windows 10 itself supports the Dial for scrolling, zooming, selecting, undo, fast-forward, rewind, volume changes and other interface navigation jobs. Surface Studio works with the existing Surface Pen product, and using a Dial with one hand and a Pen with the other brings new capabilities to illustrators and others. Surface Dial runs on two AA batteries, which should last for a year. The Dial ships Nov. 10 for $99, but ships free with Surface Studio if you pre-order the PC before it ships. The Surface Dial is a glimpse of the peripheral devices to come. In the near future, the keyboard will rest on the screen as well, and the messages, emails, documents or whatever it is you're typing will appear directly above wherever you place the keyboard. Placing your phone or camera on the screen will cause the pictures inside to "spill out" onto the screen. People are griping about the price ($2,999 to $4,199), the less-than-gaming-quality compute power and the fact that screen resolution doesn't quite match comparably sized iMacs. But all this missed the point. The psychology of using the work surface as the computer, placing peripheral devices on the screen and for documents and other artifacts to default to life size makes digital content creation seem more like real life. Instead of looking in one place (the screen) and interacting with things on that screen elsewhere (trackpads, keyboards, drawing tablets), the Surface Studio concept lets you touch and move and navigate through on-screen objects and creations directly. Instead of a desktop PC sitting on a desk, and surrounded by papers, sticky notes, books and other analog clutter, the Surface Studio concept is to make it all digital, but continue to use it in the same way. So you could imagine an open e-book, virtual yellow sticky note reminders, a stack of virtual documents and a virtual notebook filled with your scribbles -- all on the screen instead of littering your desk. The Surface Studio concept not only makes existing desktop PCs obsolete, it makes desks themselves obsolete, especially as ever larger versions of Surface Studio like PCs come on the market. The Surface Studio is available now for pre-order and ships in "limited quantities" in time for the holidays. More than nine years ago, I asked in this space the question: "Will Microsoft beat Apple with its 'giant iPhone'?" Finally, I can report the answer: Yes! More importantly, Microsoft is showing the industry a path to a much needed transition away from WIMP computers and toward the giant tablet model of the future. In a single week, Google dragged your meetings into the cloud, Apple killed off a wide range of obsolete PC technologies and Microsoft pointed the way to the next-generation PC of the future. We're all going to love the future of PCs -- whether we like it or not!